Leopoldo Maler was born in Argentina in 1937 and graduated in Law from the University of Buenos Aires. His artistic career was launched in 1961, when he moved to London and began to combine different media, such as film and installation or sculpture. It is worth pointing out that Diagonalmente correto [Diagonally correct] is Maler’s first non figurative, monumental sculpture. A very simple geometric structure develops from a partially buried rectangular figure, divided into two sections by a winding slit. Pleasant to look at, this elementary piece is endowed with harmonious inner movement and surprising elegance — its weight is counterbalanced not only by its graceful shapes, but by the vivacious combination of colours livening up the environment. A closer look, however, shows that the undulating line cutting through the leaning rectangle frames the view of the surrounding landscape, where the eye is able to capture the meandering line drawn by the River Ave, as well as its formal relationship with the sculpture. 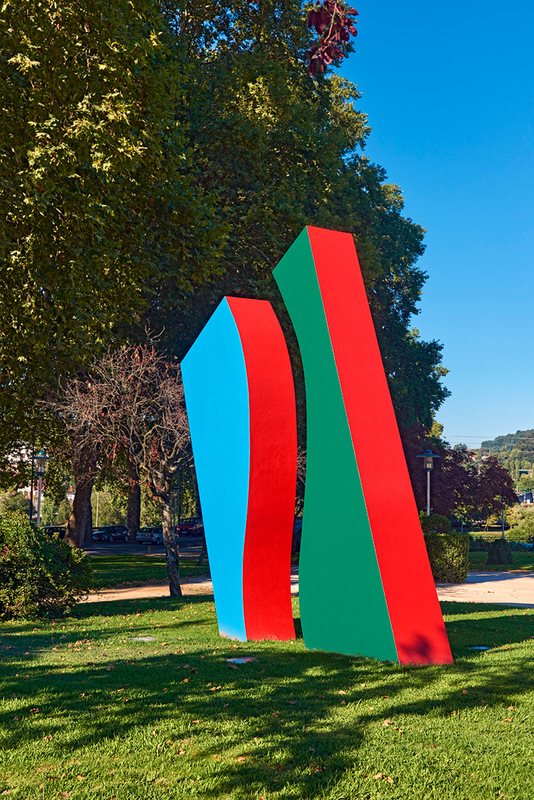 As a consequence, despite the dramatic contrast with the environment, brought about by the impression of oblique unbalance and the eccentricity of opposed colours, Maler’s piece subtly allows viewers to visually reframe the surrounding landscape, discovering the intimate connection between the two, until then imperceptible to the naked eye.